One thing I get asked all the time is, "How can I get all the Brewer diet protein?" It sounds hard to get 80-100 grams of protein a day, but the key is really healthy snacks. The Brewer diet isn't just about protein though- whole natural foods you make yourself is the key to what is essentially a healthy diet. Please add your own in the comments! You can check out this post for more ideas too. ~Bean dip with whole grain chips. You can use canned refried beans warmed up or, my health food store has yummy organic dried bean flakes with seasonings that you just need to add water too. Some cheese and greens and tomatoes on top and you can get some of your veggies in too. 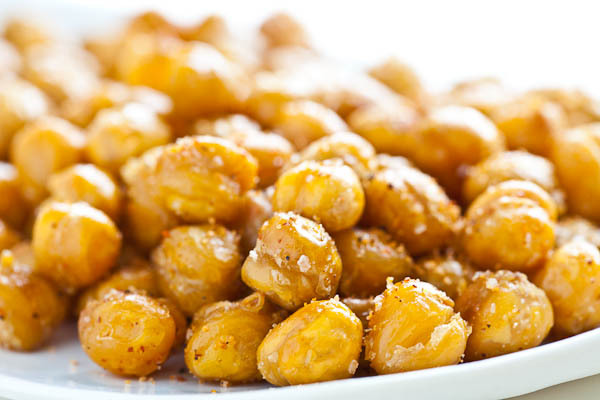 ~Garbanzo beans- I love these with just a little bit of olive oil, sea salt, and a dash of pepper. You can just use the canned ones or cook your own in your crock pot over night. Easy and my kids like them too. Keep them in the fridge so they are ready when you get hungry. ~Breakfast oatmeal- Easy and quick- getting your protein early in the day really made me feel better too. When the oats are hot you can throw in a few raw eggs and stir until they turn white and are cooked to up your protein without feeling like you are streamlining eggs. Yummy topped with coconut and raw sunflower seeds and a little honey and butter. ~Smoothies- my new favorite is milk, raw spinach, two bananas, a tray of ice and that's it! If you wanted more protein you could add some whey or another form of protein powder. I do these post-partum too and I feel like I lean down quicker but still have tons of milk with all the nutrients. Plus they are fast and easy and sometimes the kids like them and you can get them to drink their greens. ~Spinach dip with veggies or crackers- I make one with plain yogurt, mayonnaise, water chestnuts, green onions, some onion soup mix seasoning and a package of frozen or some handfuls of raw spinach. Yummy. ~Raw nuts, roasted nuts, honey nuts- carry a little bag of nuts with you everywhere. Raid the bulk bins at your local health food stores for a few different kinds. Trail mixes are awesome too. Plus these are also fantastic snacks for the kids. They will love them and won't go bonkers like they do with sugar stuff. ~My favorite weird pregnancy craving- Whole wheat bread, cheddar cheese and fresh ground peanut butter in a sandwich nobody else will want. People always stare at me and nobody wants to share (so I get it all to myself), but there it is. You probably won't like it but now you know something strange about me. Good post! I have a hard time getting all the protein my midwife recommends and think the Brewer diet is too high in protein, but, at the same time, I recognize the need for good, high quality protein as part of a balanced diet. I haven't wanted a lot of meat this pregnancy, so these are some snacks I've been eating often...apple slices with peanut or almond butter; cottage cheese with diced tomato, carrot, green pepper and/or scallion; yogurt with fresh fruit and/or homemade granola (lower in sugar and fat than store-bought); hummus on whole grain bread with veggies or as a dip; lentil soup with kale; eggs in an omelette, egg-in-the-hole, or egg salad; nut butter and jelly on whole grain. Haha. I had a friend in middle school who loved pb and cheese sandwiches. Peanut butter and cheese (Vermont sharp white cheddar, specifically) on 12 grain bread was a dietary staple for my last pregnancy. I ate it at least once a day for weeks! love this! i'm always looking for more ideas and recipes to offer my clients to help them get their protein in! thanks for sharing!